Looking back in admiration and appreciation at those who have paved the way for us allows us to respectively continue the forward-thinking tradition that helps drive our business today. 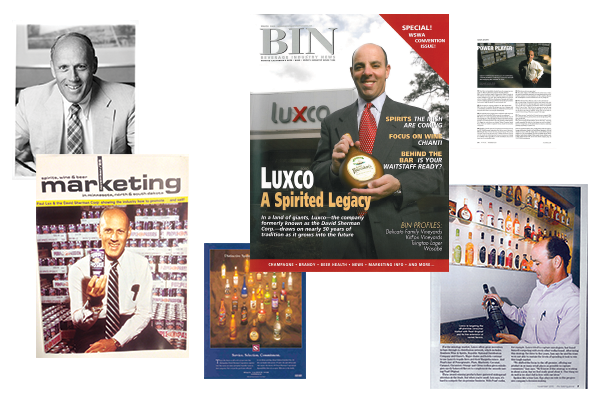 Luxco was born of humble beginnings back in 1958 when Paul A. Lux and David Sherman Sr. established the David Sherman Corporation (DSC) as a private label bottler to serve the needs of distributors, wholesalers and retailers. Since that time, the company has quietly and patiently grown into a leading producer, bottler, importer and marketer with an impressive portfolio of beverage brands. In 2006, DSC re-branded itself to Luxco as a tribute to our founder, Paul Lux, and as a reflection of the current ownership of the company. The growth of our brands has mirrored that of our company’s. Through innovation and acquisition, we have steadily built our brand portfolio from one brand in 1960, Juarez Tequila, to the diverse family of brands we enjoy today. As we have evolved, Luxco has remained true to our roots. We are still family-owned, and we remain 100 percent committed to the personal relationships that continue to successfully drive our business. We know how important it is for our business partners to work with a supplier that is reliable, honest, and treats you the way you want to be treated in return – fairly and with respect. We strive to satisfy our consumers by ensuring the quality of our products not only meets the high standards we set for ourselves, but also the standards you set for us. We are proud of our family of products and stand behind the quality of every bottle we produce.